Since my last post, I rode in the forest with a fellow Newtowner that I met through Crankfire.com last weekend. He has some of his own designs for Upper Pauggussett in the freeride arena and there is definitely a lot of potential for that there. Drops and rollers litterally abound everywhere in the forest and are awaiting the feel of a rubber tire to roll across their surface. In fact, I discovered a nice slick rock between the Polly Brody and the Mulikin Trail that might be fun to ride down. We met up at Pond Brook, early Saturday Morning last and I took the Qball down Al's trail from Pond Brook to Kissing Oak and riding this section furthered my feelings that I really hate this trail. On a full suspension bike its tollerable but on a rigid, single speed it just sux. We did find a new trail with white blazes that comes off the trail at the point where you are not supposed to travel from Fall until Spring in order to protect the Bald Eagle habitat but I have yet to see where this trail comes out on the Polly Brody. I did a work out ride yesterday. I guess yesterday was the start of Bow Season for Deer because I met a hunter from Stratford walking the Polly Brody. He was decked out in woodland camo and was actually using an old fashioned bow, similar to the one I got from John Muir. I still have that bow in the garage. We chatted for awhile and then went off on our separate ways. Stopped at the fallen tree that I started cutting a few rides ago. The weight of the tree had opened the cut even more since the last time I was there. I finished sawing through in about 10 minutes but it didn't simply roll away as I had hoped. It was too heavy to move and the smaller section was still somewhat attached to the root structure and I couldn't move that either. I found a branch that had been blown down from the last windstorm that seemed strong enough to use as a lever and was able to move both sections enough to make so that a bike could get through there now. Finally! Now, you can ride through that section unimpeeded. I am thinking of also trying to find a by pass from the bypass that I am currently riding that would allow for an easier climb back up to the Polly Brody. Rather than take the road back down to Al's I decided to try to ride back up to the Polly Brody but due to the slick conditions and the uneveness of the trail it turned into a hike-a-bike. On the bypass I thought I saw the makings of an old trail that might tie in neatly with this idea. On the the otherside, near the stone wall, I found want could either be the end of that trail or just a game trail. Either way, I think I have the makings for a nice easy climb back to the Polly Brody or if I am feeling particually ambitious go over the hump, do the big roller, coast down to the drop zone, hit that drop, and pedal back out to the Polly Brody. Lastly, I made contact last week with DEP to reopen the new multi-use trail in the forest. There has been a turn over in Newtown Bridal Lands, in which the person I was working with is now selling her home and moving to South Carolina. The president of NBLA is doing the same so right now I am waiting to hear back from the Connecticut Horse Council representative on who my NBLA point of contact should be. Cindy mentioned there was a guy that lived near the forest and rides there all the time but I can't recall his name. Diane from CHC also mentioned this same person. As for the new trail, the only things left are redesignating the start off of the Polly Brody, determine whether we are going to use any of the existing Blue Trail, which would be nice because it gets us to ROW trail quicker, and then finish marking the last section where I ran out of tape. Once I get my 26er working with clipless pedals, I will ride the new route and get a map online for you to look at. Why am I waiting for clipless on my 26er you might ask? Since I have started riding clipless on my 29er I just can't get over the feeling of security that I have being clipped in. It's wierd. I feel that I have more control over the bike. A friend from CF is hooking me up with a free pair. This is just to get me through until I can get another pair of the Shimano PD-545s that I have on the Q Ball. What I like about this pedals is that they have a cage around the clip that make them platform clipless. When I am riding around the driveway with Katie, I can hop on and ride around in fliplops (although I have see sandels with clips in them) and if I am going to continue to ride XGruntry on my 26er I might as well be clipped in. One more thing. CT NEMBA is holding its Fall Fiesta at Gay City State Park in Hebron, CT. I'll be there with the Q Ball. You can log onto the CT NEMBA website for more information. Oh, and I might as well mention my latest project for CT NEMBA. 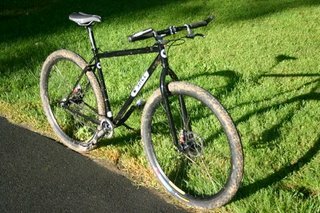 I am putting together a statewide map of all the legal places to ride in CT and calling it the CT Dirt Guide. Nothing is up just yet but I am inspired by the map that Nate has on Crankfire and an old CT NEMBA trail guide that I found in a box of brochures that the President of CT NEMBA dropped off at my house the other day, called Open Trails. Open Minds. I am going to recreate this pamphlet into a trifold, with a map of the state, the places to ride as what is seen in the original document, information about CT NEMBA's mission, and a cut out membership application form. This way, it can be mailed out, handed out, or put on display at a bike shop as a handy guide of where to ride in CT and how to get involved. Oh and I forgot to mention, I will be leading the second annual Biketoberfest ride again. The ride starts at 10 AM from the Bradley Road parking lot for Troutbrook. Afterwards, we will be heading to Old Heidelberg in Bethel for Octoberfest.